kulturpark is a collaborative project– a public art installation developed to explore an abandoned amusement park in east berlin. through a public investigation of the nature of the theme park ruins, the creative team aspires to put in place several large-scale, site-specific art installations to reinvigorate the space. ‘kulturpark plänterwald’ was originally constructed in 1969 by the GDR along the spree river as an idyllic site for mid 20th century family-leisure and was the only of its kind in east germany. the park was a cherished destination for school children visiting berlin from other eastern bloc countries. however, after the fall of the berlin wall, the woodland amusement park was privatized, sold to norbert witte, and renamed ‘spreepark’ and also declared a nature sanctuary. the fun park included a pirate ship, ferris wheel, dinosaur statues, a faux-america region and roller coasters. 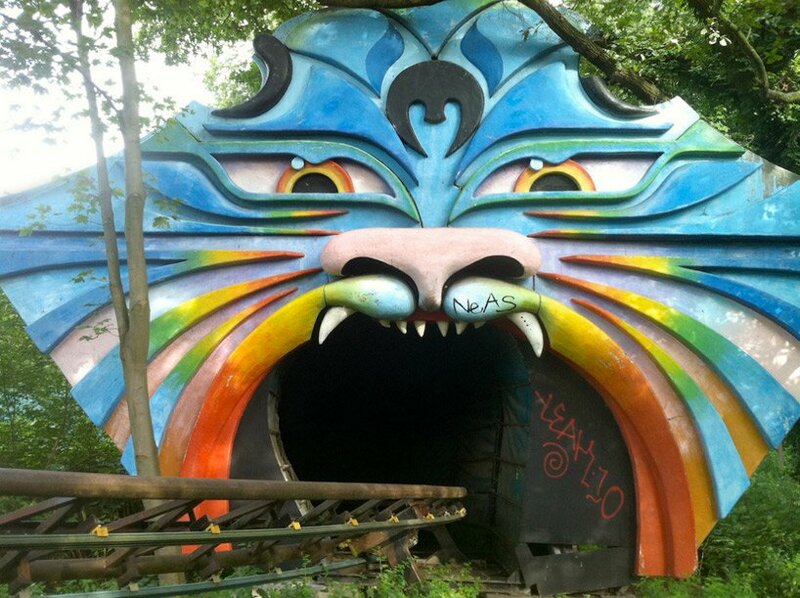 spreepark remained open to the public until financial collapse in 2001.
more than a decade after its closing, a creative team has come together to redevelop kulturpark. while the collective consists of four visionaries including curators-artists george scheer and stephanie sherman, argentinean artist agustina woodgate and curator anthony spinello of spinello projects, the group will now open the park program to public imagining. the collaborative effort, comprised of over thirty berlin and USA-based creatives, is a public art project developed to explore the recent ruins of this abandoned amusement park. through the conversations surrounding the transformation of this ruined perma-carnival, set to take place over the month of june, the team aspires to conceive of several large-scale, site-specific art installations for the area. by opening their project to the public, the creative group takes into account the history, sensibility and aesthetic of the surrounding community to better develop a space of collective imagining. the public exploration of the area is now officially set to start in june of 2012 with the concluding days of the collaborative planning month coinciding with the final weekend of the 7th berlin biennale. kulturpark has extended an open invitation to the world-wide artistic community to participate in the collaborative effort of the park’s revival for the month of june. the grassroots cultural, social and political environment is hosting three creative conferences through which the public may collectively conceive of the re-invigoration of the dilapidated park, using the region as a studio, site, and grounds for exchange. the first unit, ‘creative camp’, to take place from the 1st to 21st of june, will bring together the visionary team to begin the development of the park’s new interior aesthetic. the second installation, ‘kultur-exchange’, marks the start of workshops, lectures, projects and research for all artistic groups interested in the implications of this public-space reclamation beginning the 22nd of june and ending on the 1st of july. finally, the team and artists of kulturpark open the carnival landscape to the public for a two-day conference and additional two-day civic exchange beginning the 28th of june and ending the 1st of july. following the june 2012 initiative, harvard university researchers, experimental architects from berlin, and place makers from the urban art institute will create an urban plan for the former kulturpark plänterwald amusement park. the team hopes to reinvigorate the area with site-specific creative installations enacted upon the some-time stagnant space. the organization has launched a kickstarter campaign to support the massive public art installation. did they film ‘hanna’ in this place? i was riding this things when i was a kid. they cought the owner and his son smuggeling kilos of cokaine. I´ve been there two weeks ago. really scary wehen the wind moves the squeaking skywheel.